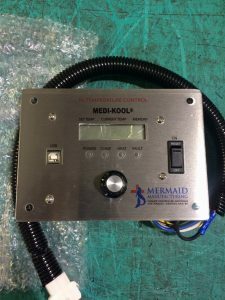 The Medi-Kool control board maintains temperatures within one degree of your set perimeter. Our control boards as of 09/2015, perform a 4 minute delay in order to regulate our new Cascade compressor. These boards can maintain temperatures as low as 32 Degrees F and as high as 110 degrees F, all controlled by the end user. These boards have the ability to read Celsius as well as come in our stainless steel finish faceplate. Our boards have the ability to pull 30 days worth of time, date, and temperature by downloading our computer program and simply connecting a USB cable. Please see our “USB DOWNLOAD” (insert attachment) for the program necessary to pull data. Follow the instructions on your PDF download, if you experience an issue with the download please contact Mermaid and ask to speak to our Purchasing department.